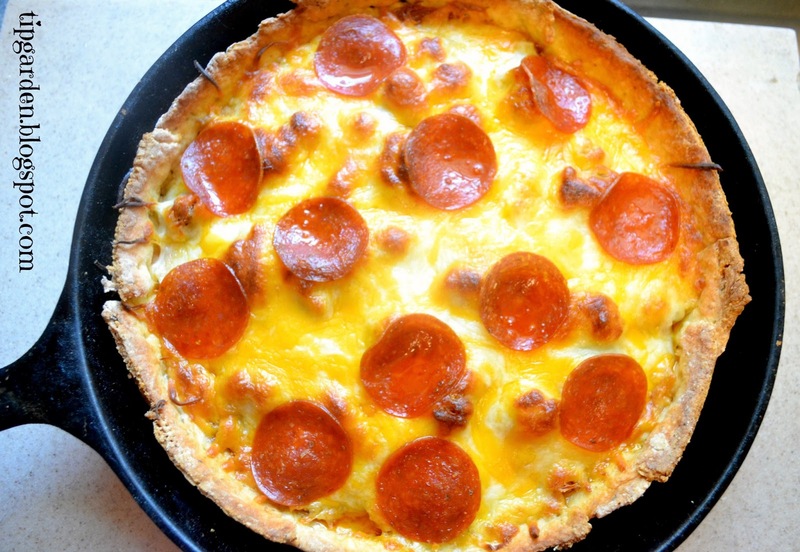 A deliciously fun version of a deep dish pizza, this Pizza Pie is baked in a cast iron skillet in the oven and is stuffed with layers and layers of your favorite flavors, topped with a cheese crust and baked to a golden brown. This homemade pizza goodness can be done in 30 minutes or less! I am all about quick and easy dinners, so please feel free to use a store bought pop open pizza dough for a quick short cut on a busy night. I used my 2 Ingredient Instant Pizza Dough and rolled it out to about a 12 inch circle, enough to fit into a 12 inch cast iron skillet. Feel free to customize your pie filling with your favorite meats and vegetables. I made a 4 meat pizza pie. Lay pizza crust into pan, pressing lightly along bottom and up the sides to remove any airpockets. Prick bottom and sides of crust with a fork. Bake crust for 5-10 minutes till it is LIGHTLY baked through and just barely browning. Remove from oven. Layer Sauce in bottom of crust. Bake at 425 degrees for 15-20 minutes till crust is golden brown and cheese is melty and lightly browning on top.